Indian envoy Pankaj Saran has pointed to an interesting contrast -- Bangladesh has concerns over the Tipaimukh hydel project in northeast India but also wants power from it. “We have a situation where on the one hand Bangladesh has included the Tipaimukh project from which they would like to receive power but on the other hand they have also expressed concerns over it," Saran told a "Meet the Press" at the National Press Club. “So we have to reconcile the two. There is a need to recognise the contradictory situation,” he said. 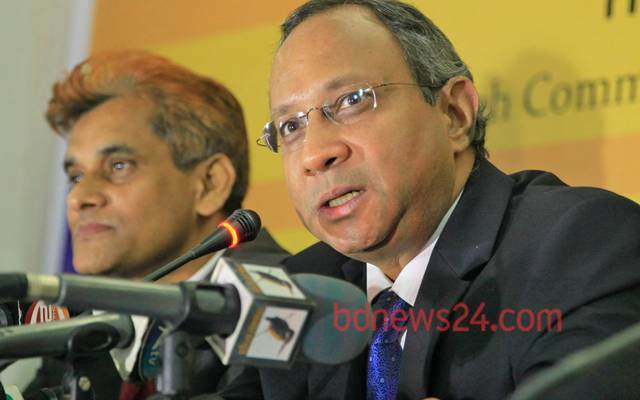 Talking of India-Bangladesh relations, Saran said it was more complex than it appeared to be. But he said the relations were at a "new high". Bangladesh has been voicing concerns over the Tipaimukh dam on the upstream of the Barak River despite Delhi’s assurances that “nothing will be done that will be harmful to Bangladesh”. The issue is being discussed in the Joint River Commission between the two countries. Saran touched upon all aspects of the bilateral relations in six categories: political and security, development cooperation, trade, commerce and investment, water issues, regional and sub-regional cooperation and people to people contact. Based on the historical experiences, he said both countries could “maximise gains without harming each other”. “We both benefit by working together to maximise our gains,” he said. Saran said India always respects a sovereign and independent Bangladesh and that “cooperation does not mean anyone is sacrificing sovereignty”. He said 16 projects worth of $794 million had been identified and $200 million grants under India’s $1 billion line of credit (the biggest ever to any country) has already been made available to Bangladesh. The Finance Minister in Parliament said Bangladesh would use the $200 million for the Padma Bridge project that Bangladesh plans to do with its own resources. The envoy said they had invited Prime Minister Sheikh Hasina again to visit India, but date has not been fixed yet. He once again reiterated India’s commitment to resolve the unresolved issues including Teesta water sharing deal and ratification of the land boundary agreement that the ruling Congress government was trying to implement in the face of resistance from the opposition. The envoy said India's ruling party politicians were working to build consensus within their country as ratification of the land boundary agreement would need a bill to go through the parliament. He, however, acknowledged that issues of border management were challenging and sought support of the Bangladesh government. He said border killings came down ‘zero’ between January and a week ago.